Dundee is a modern, vibrant city with new developments, focusing on technology and tourism. Dundee also ranks 6th in the UK to study medicine and one ‘must see’ medical attraction to compliment this is Dundee Science Centre’s ‘Medical Marvels’ Exhibition and Science Learning Suite that opens on Monday, 2 July. Blue2 are delighted to get behind such a fascinating exhibition and to work on Dundee Science Centre’s digital marketing accounts. The team were invited to view the exhibition before opening and were taken by surprise as they ventured through a learning suite and then an area of medical artefacts. The exhibition had an operating theatre where you could perform mock surgery on an interactive torso. Other areas included the vein finder, virtual anatomy table, ultrasound table and more hands-on interactive areas. 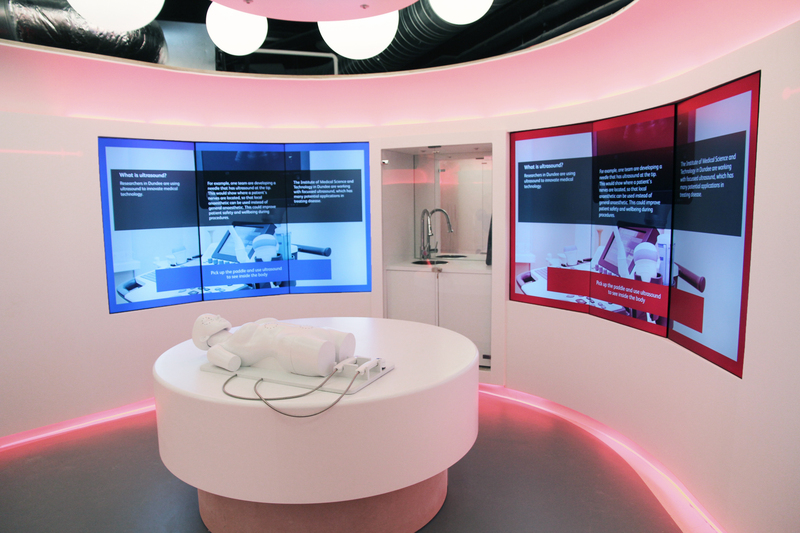 The features and scenarios that are explored in the medical industry will contribute to a positive learning environment to students and visitors to the attraction. The Science Centre has put a lot of thought into the medical industry and they recognise traditional and modern approaches to medical science in an exciting and unique way.